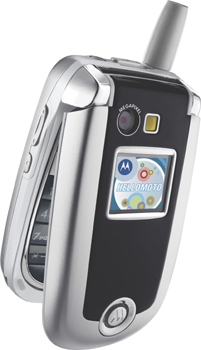 The Motorola V600 has morphed into the V635, delivering a 1.2 megapixel camera, video capture and playback, expandable memory and EDGE technology. With enhanced imaging features and the faster speeds that come with EDGE*, the model V635 becomes a powerful multimedia device. Whether you want to shoot, snap or send, the V635 can handle your imaging needs while on the go. Complete with Bluetooth wireless technology and quad-band reach*, the Motorola V635 offers seamless sharing. The model V635 also functions as a wireless modem for 'always on' Internet connections and downloading and sharing data with rapid convenience*.